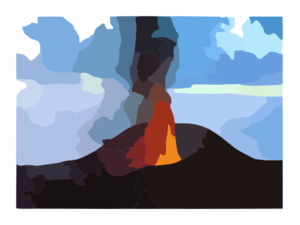 In today’s news, Hekla seems to be rumbling again as reported by RÚV and others. Volcanoes are just a fact of life in Iceland, and people don’t seem to get too worked up about it. You do the best you can to prepare for it, and get out of the way when nature takes her inevitable course. In the text it appears in the subjunctive form bendi. In this sentence liggja yfir stood out; liggja generally just means lie/stand, but with yfir + dative it expresses working hard at something. You could also translate eins og staðan sé núna as in the present situation I think. Here we see it used as vara við + dative, to warn about something.